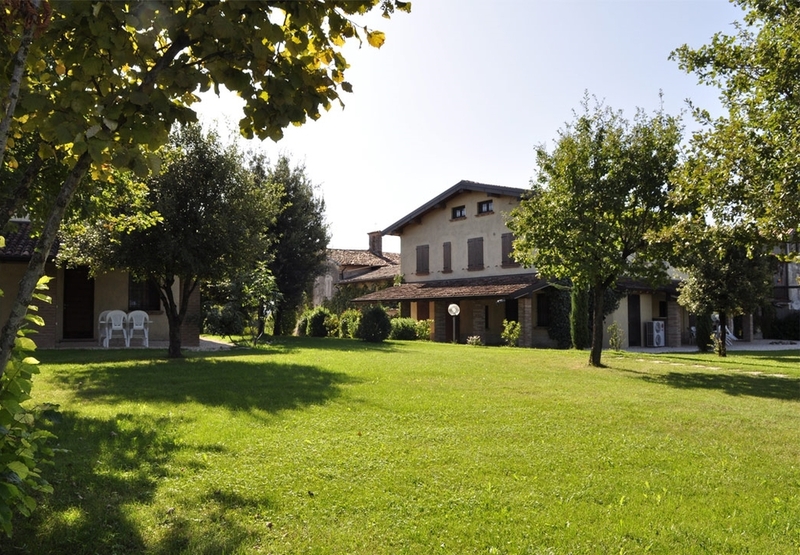 Borgo San Donino is a cluster of buildings located 900 metres from our winery at Cascina Capuzza. At its heart is the Little Pre-Romanesque Church built in the 13th century and which we still use. The 11 apartments are divided between a large farmhouse and a restored barn. The grounds include an outdoor swimming pool, and a garden surrounded by the estate’s vineyards and olive groves. The magnificent Lake Garda is a 5-minute drive from the agriturismo. There are lovely vineyard walks to take all around the property, and bicycles are available on loan for those who want to explore the area further. Our intention is to provide a stress-free experience of living in the country: we don’t put TVs in our apartments! However, if you can’t tear yourselves away from your screens, free wifi is available. Our furniture is simple and functional: it has been designed and custom-built by using solid wood. We’ve used non-toxic paints. We have eco-friendly air conditioning in every room. All the apartments are self catering. It’s much more fun to go to the local markets to buy real Italian products, but of course our Cascina Capuzza restaurant is open through the majority of the year. Each season has colours and different perfumes. Each hour of the day and of the night goes with a different singing: the croaking of the frogs, the call of owls, flapping of swallow's wings or just the wind blowing through branches trees. This is the reason why we have decided not to put televisions in Borgo San Donino. The big pool is in a wonderful position among a little wood, the vineyard and the old summer stall. The aim is not to disturb who wants to sleep. The property is a little ecological oasis: inside of it hunting is prohibited, so that wild animals ( hares, foxes, pheasant, squirrels, owls) can stay in Selva Capuzza because is a safety and peaceful place.